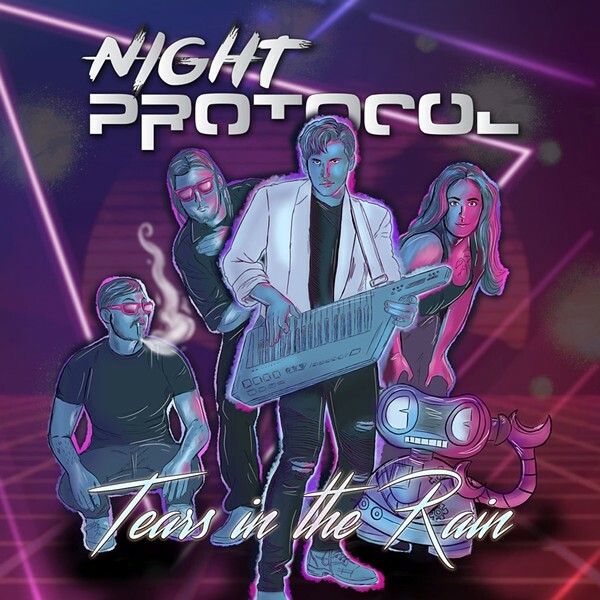 Night Protocol are a four-piece party machine devoted to "synthwave," a subgenre that pays tribute to '80s electro-trash pop classics. Few pockets of pop culture are not steeped in winking irony, but synthwave is dead earnest. The band's debut album, Tears in the Rain, is a glittering monument and an absolute blast. Night Protocol's live sets are always an impressive spectacle. The band is stupid tight, and its presentation is all over-the-top glam excess. Its shows also make it clear how central Matthew Binginot is to their sound: He dashes about behind a wall of equipment, orchestrating tracks and controlling the drum sequencing. He also steps out front with a goddamned keytar and kills it. Rounding out the sound are Justin Goyette on guitar and Ryan Blair on bass and keys. The results are lush but never crowded. Everyone here can absolutely rip on their respective instruments, but the focus is always on the song itself. The band's secret weapon is vocalist Andy Lynn. Her timbre and delivery couldn't be more suited to the music; she's a cool, confident presence. Honing this material for years in front of a crowd pays off big on Tears in the Rain. Every track is locked in, from the opening wash of "Onset" — which channels Tangerine Dream and hits you like a drug — to the inspirational soundtrack vibe of "Through the Fog," a proper epic. Along the way, there are some real showstoppers, especially "Time Is Running Out" and the title track, "Tears in the Rain," a sad song that slaps hard. The album wraps up with two excellent remixes. First up, BTV electronica expert Clothcutter transforms "Moonlight" into a spacious jungle workout. Industrial collective Nechromancer bat last, reworking the anthemic feel of "Time Is Running Out" into a dark, urgent track that sounds like a vintage Skinny Puppy B-side. Those remixes were a good creative call, not an afterthought. The band's subgenre shifts don't break the fourth wall so much as emphasize how savvy Night Protocol really are. This isn't pastiche, but rather a labor of love. And it's a tribute to the band's songwriting that it translates so well in remixes. Interestingly enough, the liner notes state that the album was recorded, produced and mixed by ... Night Protocol. Coming from most bands, that claim would be attempted comedy, but the unity of vision heard here makes it easy to believe. Thanks to the final mastering touch at Sun Room Audio in Cornwall, N.Y., Tears in the Rain sounds every bit as great as the band's iconic '80s inspirations did. This oddball posse couldn't have done a debut LP any better. While synthwave may be a niche pursuit, the band's organic energy and classic pop sensibilities make for an album with broad appeal. I would advise anyone to give this a spin — and then go catch the group live. Tears in the Rain is available at nightprotocol.bandcamp.com.